If your child gets into the habit of brushing their teeth when they’re still very young, they can reap a lifetime of benefits. However, you shouldn’t just go to the local grocery store, pick up any old toothbrush, and tell your child to use it. Dr. Mira Albert is here to offer some handy tips on how to choose the ideal tooth-cleaning tool for your little one. Have a head that is small enough to fit comfortable in your child’s mouth. Have soft bristles made of a round-ended material that won’t irritate your child’s gums. Have a handle that is easy to hold onto. It’s also worth noting that your child should like their toothbrush. If it is a pretty color or features their favorite cartoon characters, they may be more likely to have a positive attitude about caring for their pearly whites. Before your baby has any teeth, you may simply use a soft cloth to clean their gums. However, you could also use a toothbrush that is designed for babies. These have a very small head and extremely soft bristles. Toothbrushes for toddlers also have small heads, but their handles are quite large, which makes them easy for little hands to manipulate. It’s fine to let your child brush their teeth, but when they’re very young, they can’t do a thorough job on their own. You’ll have to take over their toothbrush and follow their tooth-cleaning attempt with a more systematic pass. Brushes designed for kids in this age range have slimmer handles and larger heads that are meant to clean both primary and permanent teeth. As a general rule of thumb, kids that can tie their own shoes have enough dexterity to brush their own teeth. However, you should still supervise their brushing habits until you’re sure that they’re responsible enough to keep their own mouth nice and clean. Brushes for children ages 9 and older may be very similar to adult brushes, but with slightly smaller heads and large handles. You might even consider investing in an electric toothbrush for your little one since kids tend to enjoy using them more. They’re also great for kids who might not have the patience or dexterity to effectively use a manual toothbrush. If you’re still not sure which toothbrush to buy for your child, talk to their dentist at their next checkup. Not only can the dentist coach both you and your child on proper oral hygiene, but they may also offer specific product recommendations. Happy brushing! 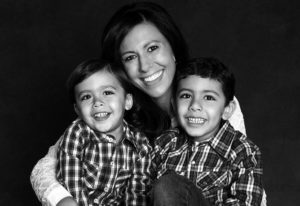 Dr. Mira Albert has been a pediatric dentist in private practice since 2006. In 2011, she founded Brush Pediatric Dentistry on the principles of excellent, compassionate care and the idea that dentistry should be enjoyable for children. If you have questions about how to care for your child’s teeth, or if it is time for your little one’s next checkup, contact our office at 630-504-2223.